The most-active February gold contract on the Multi Commodity Exchange was 0.61 percent higher at ₹ 28,036 per 10 grams by 2:10pm. “Demand is muted. 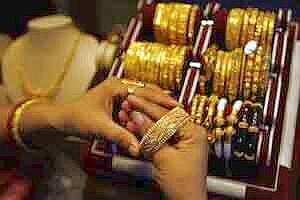 Jewellers tend to restock during this period as they prepare for the wedding season, but the price above 28,000 rupees discouraged them," said a Mumbai-based dealer with a private bank dealing in bullion. International spot gold rose to a one-week high on Wednesday as encouraging data from the United States and Germany helped ease fears about an economic slowdown, with a weak dollar adding support to prices. The rupee plays an important role in determining the landed cost of the dollar-quoted yellow metal. On Wednesday it appreciated and capped the upside in bullion.